Welcome to PercyPods Pet Emergency blogs. We hope that you and your pets have been well since our last one. This week we are going to discuss causes of red eyes and what might need to be done about them. The eyes are clearly very important to an animal just as our eyes are important to us, and eye problems can sometimes be really quite painful. Worse still some eye problems if not treated appropriately can result in loss of sight. It is very important not to take any chances with your pet’s eyes and to get them seen by a vet if you have any concerns at all. It can very difficult if not impossible for your vet to reliably advise you on your pet’s eyes until they have actually been able to examine them. Okay so let’s start by considering in very basic terms what the eye is made up of. It is important to have a basic level of knowledge about this to help us understand why the eye can take on a reddened appearance. The eye is made up of a front part that we can see easily and a back part that we cannot see without using a special instrument. The front part is called the anterior chamber; it is filled with clear fluid and covered by a layer of tissue known as the cornea. The cornea is normally clear and see-through. When you look at your dog or cat’s eye you may also be able to see the so-called white of the eye, or more properly the sclera, which is covered with little tiny blood vessels. Part of the white of the eye is covered by the conjunctiva which are soft pink-looking bits of tissue that also line the insides of the eyelids; the conjunctiva also contain lots of blood vessels. Dogs and cats have a so-called third eyelid, or more properly the nictitating membrane, which is usually hidden out the way in the bottom corner of the eye near to the nose. The third eyelid is normally translucent and can come across the eye for a variety of reasons; we see this quite commonly in cats that are sick as well. Why may the eye look red? Okay so now that we have briefly considered the structure of the eye, the next question to ask is why the eye can take on a reddened appearance. Well, there are two main reasons why this might happen. The first, and the most common, is because of inflammation. Just like other tissues and organs in the body, the eyes can become inflamed – for example because of an infection or trauma. One of the classic signs of inflammation is redness which occurs because blood vessels become wider and there is therefore an increase in the amount of blood flowing to the area. As we mentioned before, there are lots of blood vessels in the part of the eye that we can see easily and it is not therefore surprising that an inflamed eye would have a reddened appearance. Inflammation of the eye is also likely to be painful and depending on which part is affected, we may also notice swelling. Once an eye has been damaged, sometimes new blood vessels also start to grow and add to the red appearance. The other way in which an eye can take on a reddened appearance is because of bleeding. Bleeding may occur externally or into the front part of the eye, the anterior chamber, that we mentioned before. Some blood cells have a red appearance and so bleeding will cause the eye to look reddened. Okay so now that we have considered why the eye can look red, we are going to talk briefly about some of the more common causes, what you may notice and what might need to be done. The majority of causes of red eye are also associated with varying degree of pain. The animal may hold his or her eye closed so they look like they are squinting, they may blink a lot, or they may rub their eye with their paw or along the ground or on a piece of furniture. They may be particularly sensitive to light and in some cases you will note some loss of sight. Excessive tear production may also occur resulting in a watery-looking discharge. These signs are likely to be more obvious in dogs than in cats. Trauma is a common reason for your pet to have a red eye and it can cause both inflammation and bleeding. There are various ways in which your pet can traumatise their eye, for example from running into something or when they take a knock from another animal when playing. Trauma can affect various parts of the eye to make it red and painful. 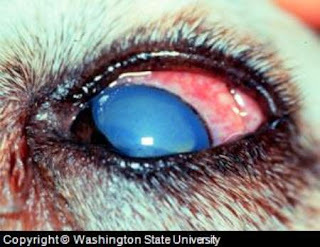 Conjunctivitis is another reason why your pet’s eye may look red. You’ll remember that we said that the conjunctiva are soft pink-looking bits of tissue that line the insides of the eyelids and that they contain lots of blood vessels. Conjunctivitis refers to inflammation of these conjunctiva which makes them red and swollen. Causes of conjunctivitis include irritation for example from dust or smoke, an allergic reaction, dry eyes due to poor tear production, and infections; infectious causes are especially common in cats. Conjunctivitis may be painful but in itself it is not usually something that threatens your pet’s eye-sight. Treatments that may be used for conjunctivitis include eye ointments that may contain anti-inflammatory steroids and antibiotics, as well as artificial tears. There is an important difference between dogs and cats when it comes to using eye treatments that contain steroids as while these treatments are often used in dogs, they are only used rarely in cats. This is because steroid-containing eye drops may cause cats with a history of cat flu to have a relapse or they may cause ulcers in the cornea. As we mentioned before the front part of the eye is covered by a layer of tissue known as the cornea that should be clear and see-through. When the cornea becomes abnormal it often takes on a cloudy appearance. Problems with the cornea can also lead to the eye looking red as well – these problems include inflammation, which we call keratitis, and corneal ulcers. Corneal ulcers are relatively common but they vary in terms of their severity. Some ulcers are only mild and superficial while others can affect the whole depth of the cornea even resulting in it rupturing. Causes of corneal ulcers include trauma, infections, lack of tear production and foreign bodies. Exactly what you will see and the treatment that will be needed is very much dependent on the severity of the ulcer. Some cases just need eye drops or ointments while others may need antibiotic or anti-inflammatory tablets and even some kind of surgical procedure including as an emergency to save the eye. Other problems that can affect the cornea and make the eye red and painful include a foreign body getting stuck in the cornea – for example a thorn or wood chip – and if the cornea suffers a cut. It is not uncommon for example for a cat to scratch the cornea of a dog during a confrontation! Two of the most worrying causes of a red painful eye are conditions known as glaucoma and anterior uveitis. Glaucoma is a condition that you may have heard of as it is quite common in people and let’s start by talking briefly about it. Glaucoma is basically a condition that occurs when too much fluid builds up in the eye. There is normally some fluid in the eye to help maintain its shape. This fluid is constantly added but also removed so that the pressure within the eye remains normal. However if this fluid builds up, it results in an increase in pressure in the eye which can then damage important structures. Build up of fluid in the eye is usually because of a break down in the drainage system which means that fluid is added but no longer removed. Glaucoma may occur in certain animals, such as Cocker Spaniels or Basset Hounds, as a primary problem without an underlying cause. However it may also occur as a result of another problem in the eye – this is called secondary glaucoma and underlying problems include for example cataracts or luxation of the lens of the eye. Glaucoma can be extremely painful – although it is not always – and is an emergency problem; without timely treatment there may be permanent loss of vision in the affected eye. Your vet may suspect glaucoma based on the appearance of the eye – the eye will be red and cloudy and the pupil will be wide or dilated. However to confirm the diagnosis it is necessary to measure the pressure in the eye which we do using a special instrument known as a tonometer. Emergency treatment of glaucoma is aimed at reducing the pressure in the eye which may involve administering medications to the eye itself and/or via a drip into a vein. Pain relief is also essential. Let’s now talk about anterior uveitis. Anterior uveitis basically means inflammation of certain parts of the front of the eye that make up what is known as the uveal tract. Causes of anterior uveitis include trauma, luxation of the lens of the eye, infections and some diseases that affect not just the eye itself but also other parts of the body. Again the eye is red, painful and potentially cloudy but unlike in glaucoma where the pupil is wide, here it is narrow or constricted. If your vet measures the pressure in the eye it is usually lower than normal in this condition. Treatment for anterior uveitis involves applying medications to the eye itself including anti-inflammatory drops and something to open up the pupil, as well as possibly pain-killer tablets. As we mentioned at the beginning the eye can look red for two reasons really: one because of inflammation; the second because of bleeding. So far we have focused on inflammation as this is the most common reason why the eye looks red. But before we finish the podcast we just want to mention bleeding. Bleeding can occur into the front of the eye which gives it a red appearance. This bleeding can occur due to a variety of reasons. Some of these are problems that only affect the eye – for example if the eye suffers trauma – but in other cases the animal may have evidence of bleeding in other places too if they have a clotting disorder. Very high blood pressure can also cause bleeding into the eye. The treatment for bleeding into the eye usually focuses on treating the cause although occasionally drops or ointments need to also be used on the eye itself. In general in many cases of red eyes the eye will also be painful and we would encourage you not to take any risks with your pet’s eyes and to see a vet as soon as possible if you are worried. In some cases the problem may be relatively mild but in other cases apart from potentially being very painful there may be a risk of loss of vision. Treatment for a red eye will obviously depend on the cause of the problem but also how serious it is. Treatments that may be needed include eye drops or ointments containing anti-inflammatories, antibiotics or lubricants; tablets and possibly some kind of surgical procedure may also be required, as well as keeping the eye clean if appropriate. With any condition affecting the eye, sometimes your pet will need to wear a Buster collar or an Elizabethan collar to stop him or her from pawing at their eye or rubbing it on the ground. You have probably seen these collars before; they look a bit like lampshades and most animals do not appreciate having them on but sometimes we have to be cruel to be kind! Your vet will examine the eye as well as the rest of your pet’s body and take a thorough history from you to help them come up with the most likely diagnosis and best treatment plan. In some cases your vet will recommend that your pet is seen by an eye specialist if the problem is more complicated, severe or difficult to diagnose. Okay so that brings us to the end of this blog on red eyes. The next blog will be in approximately 4 weeks time when we will talk about kidney failure. Remember that if you have any comments or questions on this blog, or indeed any suggestions for future blogs, you can contact us in the usual ways. Via email on percypods@gmail.com; via the PercyPods Facebook page; or via Twitter on @PercyPods. Also don’t forget to subscribe for future episodes via the RSS feed or iTunes. So thank you for reading and until next time, may you and your pets be safe.